Ship Systems in the construction of new cutters and the modification and lengthening of others. Anywhere you need reliable, heavy-duty drilling, count on Lamina. Our powerful hydraulic drill makes a 2-inch hole in seconds, yet is compact and portable... use it in drydock, or even at sea. Drill or tap in any direction - up, down, or sideways. It's rugged and easy to operate, needs far less maintenance than electric drill equipment, and even works underwater. Some have been in use for 30 years, and our latest model practically eliminates downtime. Lamina drills meet all applicable standards, in North America and Europe. Five heads are available, with quick-change tools for a range of tasks. Call Anchor Lamina today... and ask about our convenient rent-to-own program. 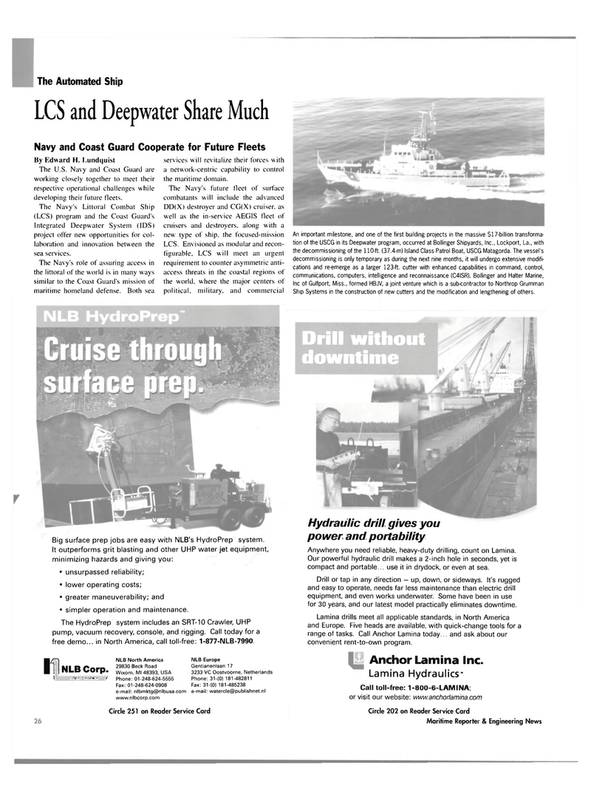 Big surface prep jobs are easy with NLB's HydroPrep system. It outperforms grit blasting and other UHP water jet equipment, minimizing hazards and giving you: • unsurpassed reliability; • lower operating costs; • greater maneuverability; and • simpler operation and maintenance. The HydroPrep system includes an SRT-10 Crawler, UHP pump, vacuum recovery, console, and rigging. Call today for a free demo... in North America, call toll-free: 1-877-NLB-7990. The U.S. Navy and Coast Guard are working closely together to meet their respective operational challenges while developing their future fleets. Integrated Deepwater System (IDS) project offer new opportunities for col- laboration and innovation between the sea services.